This is a sample real estate tax bill similar to one that would be issued from the Treasurer's Office. To receive more information on a specific area of the tax bill, move your cursor over the area. If you would like a printable copy of the explanations please click here. About your Tax Bill The contents of your real estate tax bill are prescribed by Ohio law. Only one parcel of property can be included on a bill. Failure to receive a tax bill does not excuse failure or delay to pay any taxes, special assessments, or other charges shown on such bill or avoid any penalty, interest or charge for such delay, pursuant to Sec. 323.13 O.R.C. Tax Increases Any increase in the amount of your current real estate tax must be attributed to valuation changes, tax levies or bond issues. Any increase due to tax levies or bond issues was voted upon and passed by the voters of your taxing district. Your County Treasurer has no authority to increase or decrease your real estate tax. 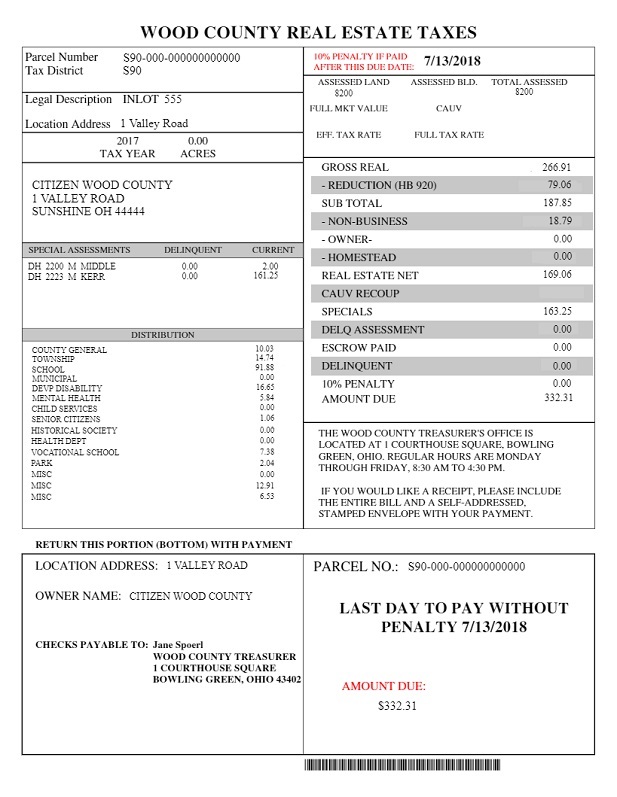 Monthly Payment Plans The Wood County Treasurer's Office offers a monthly payment program to help taxpayer's in paying their taxes. This program is referred to as the Monthly Prepay Escrow Program. Notice If taxes are not paid within one (1) year from the date they are due, the property is subject to foreclosure for tax delinquency. Notice If the taxes charged against this parcel have been reduced by the 2 1/2 per cent tax reduction for residences occupied by owner but the property is not a residence occupied by the owner, the owner must notify the County Auditor's Office not later than March 31 of the year following the year for which the taxes are due. Failure to do so may result in the owner being convicted of a fourth degree misdemeanor, which is punishable by imprisonment up to 30 days, a fine up to $250, or both, and in the owner having to repay the amount by which the taxes were erroneously or illegally reduced, plus any interest that may apply. If the taxes charged against this parcel have not been reduced by the 2 1/2 per cent tax reduction and the parcel includes a residence occupied by the owner, the parcel may qualify for the tax reduction. To obtain an application for the tax reduction or further information, the owner may contact the County Auditor's Office at 1 Courthouse Square, Bowling Green, Ohio (419) 354-1632.